Portastudio for iPad: just like old times. 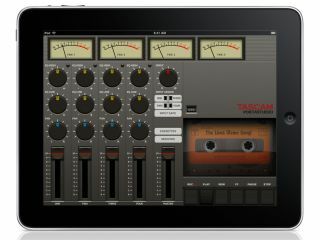 Tascam's cassette-based Portastudios were used by countless musicians to make their first recordings, and the company has now lovingly brought the brand back to life in an iPad app. Portastudio for iPad looks and works just like a classic 4-track hardware recorder - there's even a cassette graphic and accompanying 'push-down' transport controls. The app was developed by Audio Damage's Chris Randall who says in a blog post that it's a "more-or-less complete clone of the [Tascam] Porta One". Each track has level, pan and EQ controls and an analogue-style VU meter. You can mix down to a stereo audio file that can then be exported to iTunes (built-in SoundCloud upload is in the works, too). On the downside, there's no track bouncing and recorded tracks can't be exported separately (though you can get around this by lowering the levels of all but one track and then mixing down). Some class-compliant USB audio interfaces may work via Apple's Camera Connection Kit (you'll probably need mains power), but Tascam's won't. If you don't have an interface, you can record via the iPad's built-in mic or a headset mic. Portastudio for iPad is available now from the App Store priced at £5.99. Go and reminisce.